Sidle up to the sports bar and Padres hangout where everyone knows your name — because it's all yours! Perfect for the Pads fan in your life (or for yourself, who're you kidding? 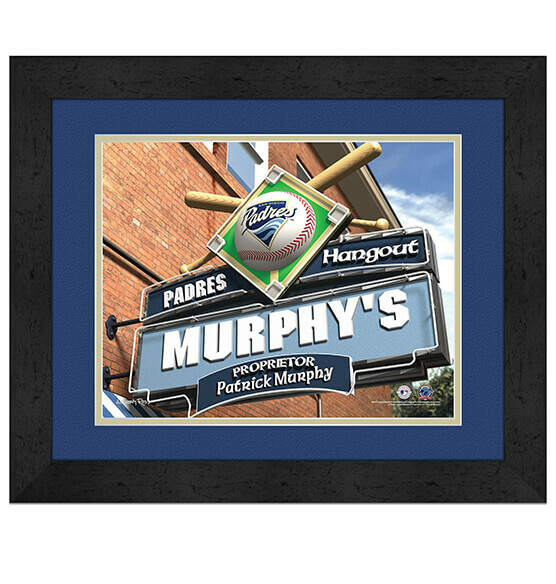 ), this generously sized MDF vinyl-wrapped frame, high-quality glass and great-looking team colors will look fantastic hanging in your home, office or San Diego Padres fan zone. Just specify the names you want on the marquee for an ultra-personalized gift that is guaranteed to hit a home run. This piece comes ready to hang with an attached sawtooth hanger for easy mounting.